NewAge software includes everything you need to produce quality, professional looking Marine Surveys from cover page to final signature page and everything between. Everything needed for both powerboats and sailboats is included. Besides your qualifications as a Marine Surveyor, it is your final survey report product that represents you and your image to your clients and the Insurance companies you deal with. Your time as a Marine Surveyor is very valuable and this NewAge system will save you many hours on report preparation allowing you to take on more assignments and increase your business. The 3D NewAge software includes everything you need to produce quality, professional looking marine surveys from cover page to final signature page and everything between. The detail content of the report is completely flexible as you can be as brief or as lengthy as you want to be. Everything needed for both Powerboats and Sailboats is included and all vessel systems are laid out in an easy to use format for rapid report completion. All your survey inspection findings, comments, recommendations, etc., can be saved for use in future reports saving you even more time as you continue to use the system. Many Findings and Recommendations are already included to use or modify to suit your needs. At the heart of the NewAge Marine Survey Reporting System is the powerful top rated 3-D Inspection System software engine. This 3D Focus Edition software is completely setup for marine surveyors and provides all the functionality that is necessary to produce professional looking marine survey reports in the format that you desire. The 3D software engine runs on a Microsoft Windows based Desktop, Laptop or Tablet PC’s, as well as some of the latest Smart Phones for recording the survey with FREE Phone 3D software.The system is easy to set up, easy to use and will save you many hours when back at your office. • Marine survey report types provided are: Pre-Purchase and Insurance/Re-insurance C & V, Vessel Appraisals, Structural Condition, Damage Claims and Automobile Load/Stow container Inspections that each produce complete detailed survey reports fully customized for each type of survey. Common vessel systems are included for Powerboats, Sailboats and Pontoon Houseboats. • Ability to insert photos anywhere in the survey report including added text, edit the photos with arrows, circles or highlights, etc. to more clearly identify a problem area. Photos can be quickly sized from thumb nail size to full size. They can also be aligned right, left, above or below the survey text or you can use separate photo pages. • Complete flexibility to change, re-organize, re-structure or modify the format of the report to look like you want. This includes use of different fonts, colors, use borders, insert graphics etc. • Automatic optional summary of report findings and recommendations. You can be as brief or as lengthy as you like. Many typical findings are already included in the system to use as a start. You can add, change or delete them. • The Cover page is practically automatic. All that's needed is to tell the NewAge program which photo to use and "attach" the cover page pre-formatted document during the survey prep. Common survey information like the survey date, type of survey, vessel name, vessel year/make/model, as well as the clients name and address, is automatically extracted from the survey report and are automatically inserted on the cover page. • Smart Phone software - Phone 3D is not necessary to use but is FREE and included for using a Smart Phone for recording the inspection to replace hand written notes. This saves translating notes when you get back to your office and figuring out where they go. This is a huge time saver. • A customizable Inspection checklist is also available if you prefer using hand written notes instead of using a Smart Phone. The system includes a data base of many typical survey Findings and Recommendations for more rapid entry. • Graphic hull diagrams that you create or any other graphic images can be imported and edited in areas you feel are necessary. • Headers and footers are available to use your own letterhead or logos on the cover page or on all pages. • Easily import your digital signature into the report on the final signature page and your accreditation seal/stamp if you use one. • Easily attach documents and other files or Thank You letters. • E-Mail your surveys as a PDF file to your clients and/or you can print a hard copy for mailing/filing. PDF support is included. • FREE Web hosting of your final report is available to all users. You do not have to own a website but can upload the PDF report to a 3D server then notify your client with a simple E-mail what the link address is to retrieve their report. The advantage to having the report on a web server over mailing the report directly is that you don't have to deal with e-mail box file size limitations. • One click web access to common surveying reference web sites, for information needed during the survey report preparation process will save you even more time. • Besides all the above mentioned features, you get unparalleled technical support from 3D Inspection Systems when you get stuck or have a question. 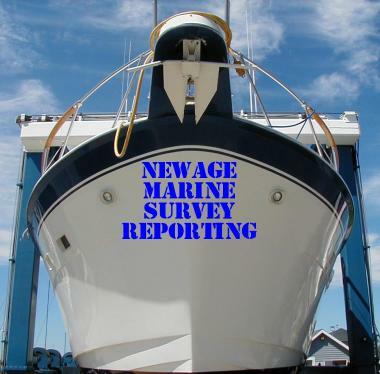 The 3D NewAge Marine Survey Reporting System will pay for itself in one or two surveys! Is there any reason left why not to upgrade to this World Class system? Visit our Web Site for more information and available discounts.